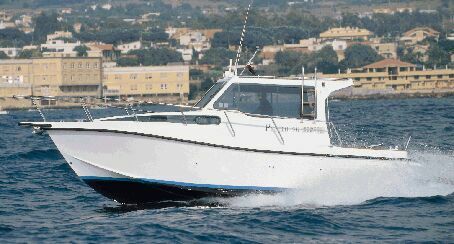 The sea trials of the cabin cruiser Proteo 28' were carried out near Civitavecchia on a day with moderate sea. Even though the sea conditions did not allow a full speed test, the seakeeping capabilities and the boat's ability of maintaining the right course were fully evaluated. Overall, the new cabin cruiser of the Ondablu yard is an excellent and comfortable boat. Notwithstanding her overall length of 28'11", on deck and belowdecks the layout is excellent. 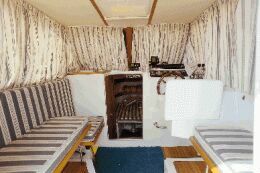 The boat's cockpit is of adequate size and it is fitted with retractable settees, moving table and access door to aft platform. Sides are quite low so as to facilitate fishing. The gunwale may be fitted with rotating and fixed rod holders, boulter winch, etc. Bow area is easily accessible and it is fitted with a sunning area for two. 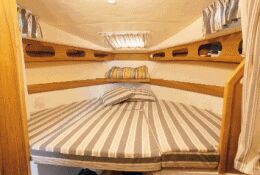 Interior layout includes ample forward cabin with V-berth convertible in a king size bed. Amidships, to starboard there is the bathroom, opposite there is the fully fitted galley. Aft there is the salon which includes the chart table to starboard and three settees, two of which are opposite and symmetrical and are convertible in two berths. Draft from lower tip of propellers: 2'3"
Total engines weight: 1,435 lbs. Price with standard equipment and test boat power: Lit. 161,000,000 ex VAT. Cockpit and deck fittings: stainless steel bow arrangement and pulpit, stainless steel fittings, glass windows, rod-holders in the cockpit, aft platform with access door from the cockpit.